This rule can be found in Chapter 15 of the Medicare Benefit Policy Manual in Section 40.4. It states; "the opt out law does not define "physician" to include chiropractors; therefore, they may not opt out of Medicare and provide services under private contract." There has been a confusing notion in the chiropractic profession that chiropractors can have the patient sign an Advance Beneficiary Notice and bill the patient without being a Medicare provider. This isn't true. There is a good handout published by CMS called "Misinformation on Chiropractic Services" that covers this rule and many others. For a copy of this handout, search for it at www.cms.gov and it will be readily available. If you are unable to find it, please email bonnie@billingbuddies.com with the subject line stating; "Misinformation on Chiropractic Services" and you will receive a return copy. 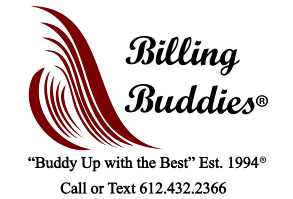 Billing Buddies ® Bullet Points is brought to you by Billing Buddies. Visit us on the web at www.billingbuddies.com. I'm your host, Bonnie J. Flom. I have 34 years of medical billing experience and am a Certified Medical Reimbursement Specialist through the American Medical Billing Association. If you have any questions or comments, please email bonnie@billingbuddies.com or call or text 612.432.2366. Our goal at Billing Buddies is to help optimize and expedite our providers' reimbursement so they are better able to serve their clients. If you should need medical billing or training services, please contact us. Have a great day and happy billing. Railroad Medicare has a different carrier to submit Part B claims. This podcast will walk you through the steps of getting your Railroad Medicare PTAN and signing up to submit your claims via EDI through your clearinghouse.